Thursday, U.S. Navy officials announced, that a little more than two years after his death, Lt Michael P. Murphy wll be bestowed with this nation’s highest combat honor. This announcement was made Thursday dring a White House briefing. Murphy will be the first Navy officer or sailor awarded the Medal of Honor for combat actions in Iraq or Afghanistan and will be only the third recepient of the award since the wars in Iraq and Afghanistan began. The medal will be presented to Murphy’s family during a 2:30pm ceremony on October 22nd at the White House. 1Lt Murphy will also be honored at two other events; the inclusion of his name on a wall at the Pentagon Hall of Heroes, which will occur at 11am on October 23rd and the presentation of the Medal of Honor flag at the Navy Memorial which is scheduled to be held on October 23rd at 6pm. I can’t think of anyone more deserving than 1Lt Michael Murphy to be honored in this way. Marcus Luttrell, in his own words, tells of the heroic action that 1Lt Michael Murphy took that day, which ultimately saved Marcus’ life. I’m sure that upon hearing the news, Marcus went through a lot of emotions, knowing that his best friend deserved this honor, but also knowing that his actions cost him his life. “And right then Mikey took a bullet straight in the back. I saw the blood spurt from his chest. He slumped forward, dropping his phone and his rifle. But then he braced himself, grabbed them both, sat upright again, and once more put the phone to his ear. “ ‘Roger that, sir. Thank you,’ ” Luttrell heard Murphy say, before the lieutenant continued to train fire on the enemy fighters. “Only I knew what Mikey had done. He’d understood we had only one realistic chance, and that was to call in help,” Luttrell wrote. “Knowing the risk, understanding the danger, in the full knowledge the phone call could cost him his life, Lieutenant Michael Patrick Murphy, son of Maureen, fiancé of the beautiful Heather, walked out into the firestorm. “His objective was clear: to make one last valiant attempt to save his two teammates,” he wrote. Not long after the call, Murphy was shot again, screaming for Luttrell to help him, but Luttrell, also hit and wounded, couldn’t reach him. “There was nothing I could do except die with him,” he wrote. 1Lt Michael Murphy’s family of course, are grateful that this announcement has finally been made, two long years after his death. Below is an excerpt of a statement the family issued following the announcement. Michael Murphy was an exceptional young American, a Hero, not only because of his service to our country, but because of the way he lived his life. 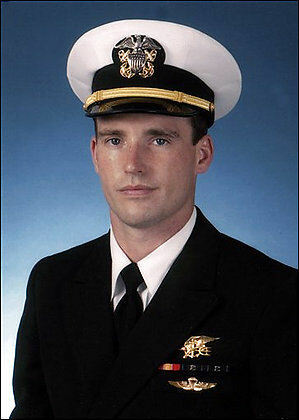 I’ll close with the official Navy biography for 1Lt Michael P. Murphy. Lt. Michael P. Murphy, fondly referred to by friends and family as “Murph,” was born May 7, 1976 in Smithtown , N.Y. and grew up in the New York City commuter town of Patchogue , N.Y. on Long Island . Murphy grew up active in sports and attended Patchogue’s Saxton Middle School . In high school, Murphy took a summer lifeguard job at the Brookhaven town beach in Lake Ronkonkoma — a job he returned to each summer through his college years. Murphy graduated from Patchogue-Medford High School in 1994. Murphy attended Penn State University , where he was an exceptional all-around athlete and student, excelling at ice hockey and graduating with honors. He was an avid reader; his reading tastes ranged from the Greek historian Herodotus to Tolstoy’s “War and Peace.” Murphy’s favorite book was Steven Pressfield’s “Gates of Fire,” about the Spartan stand at Thermopylae . In 1998, he graduated with a pair of Bachelor of Arts degrees from Penn State — in political science and psychology. Following graduation, he was accepted to several law schools, but instead he changed course. Slightly built at 5 feet 10 inches, Murphy decided to attend SEAL mentoring sessions at the U.S. Merchant Marine Academy at Kings Point with his sights on becoming a U.S. Navy SEAL. Murphy accepted an appointment to the Navy’s Officer Candidate School at Pensacola , Fla. , in September, 2000. Murphy was commissioned as an ensign in the Navy on Dec. 13, 2000, and began Basic Underwater Demolition/SEAL (BUD/S) training in Coronado , Calif. in January 2001, graduating with Class 236. BUD/S is a six-month training course and the first step to becoming a Navy SEAL. Upon graduation from BUD/S, he attended the Army Jump School , SEAL Qualification Training and SEAL Delivery Vehicle (SDV) school. Lt. Murphy earned his SEAL Trident and checked on board SDV Team ONE (SDVT-1) in Pearl Harbor , HI in July of 2002. In October of 2002, he deployed with Foxtrot Platoon to Jordan as the liaison officer for Exercise Early Victor. Following his tour with SDVT-1, Lt. Murphy was assigned to Special Operations Central Command in Florida and deployed to Qatar in support of Operation Iraqi Freedom. After returning from Qatar , Lt. Murphy was deployed to the Horn of Africa, Djibouti , to assist in the operational planning of future SDV missions. In early 2005, Murphy was assigned to SEAL Delivery Vehicle Team ONE as assistant officer in charge of ALFA Platoon and deployed to Afghanistan in support of Operation Enduring Freedom. On June 28, 2005, Lt. Murphy was the officer-in-charge of a four-man SEAL element in support of Operation Red Wing tasked with finding key anti-coalition militia commander near Asadabad , Afghanistan . Shortly after inserting into the objective area, the SEALs were spotted by three goat herders who were initially detained and then released. It is believed the goat herders immediately reported the SEALs’ presence to Taliban fighters. A fierce gun battle ensued on the steep face of the mountain between the SEALs and a much larger enemy force. Despite the intensity of the firefight and suffering grave gunshot wounds himself, Murphy is credited with risking his own life to save the lives of his teammates. Murphy, intent on making contact with headquarters, but realizing this would be impossible in the extreme terrain where they were fighting, unhesitatingly and with completed disregard for his own life moved into the open, where he could gain a better position to transmit a call to get help for his men. On the ground and nearly out of ammunition, the four SEALs continued to fight. By the end of a two-hour gunfight that careened through the hills and over cliffs, Murphy, Axelson and Dietz had fallen. Over 30 Taliban were also dead. The fourth SEAL, Petty Officer Luttrell, was blasted over a ridge by a rocket-propelled grenade and knocked unconscious. Though severely wounded, the fourth SEAL and sole survivor, Petty Officer Marcus Luttrell, was able to evade the enemy for nearly a day; after which local nationals came to his aide, carrying him to a nearby village where they kept him for three more days. Luttrell was rescued by U.S. Forces on July 2, 2005. Lt. Michael P. Murphy was buried at Calverton National Cemetery less than 20 miles from his childhood home. Lt. Murphy’s other personal awards include the Purple Heart, Combat Action Ribbon, the Joint Service Commendation Medal, the Navy and Marine Corps Commendation Medal, Afghanistan Campaign Ribbon and National Defense Service Medal. Lt. Murphy is survived by his mother Maureen Murphy; his father Dan Murphy; and his brother John Murphy. Dan and Maureen Murphy, who were divorced in 1999, remain close friends and continue to live in N.Y. Their son John, 22, attends the New York Institute of Technology, and upon graduation will pursue a career in criminal justice, having been accepted to the New York City Police Department. I am so very thankful, that I live in a country full of young men and women who are willing to risk and many times lay down their lives in defense of our very way of life. Men and women like 1Lt Michael P. Murphy. GARDEN CITY, N.Y. -- A Navy SEAL who was killed while leading a reconnaissance mission in Afghanistan will receive the nation's highest military award, the Medal of Honor. Lt. Michael P. Murphy, 29, of Patchogue on Long Island, is the first Medal of Honor recipient for combat in Afghanistan, the Navy said in a statement Thursday. In late June 2005, Murphy led a four-man reconnaissance mission east of Asadabad trying to find a key Taliban leader in advance of a mission to capture or destroy the local militia leadership. Taliban sympathizers alerted fighters to the SEALs' positions, and the four men were quickly outnumbered and came under fire, the Navy said. Even after being wounded, Murphy crawled into the open to make a radio call for help and still continued to fight, the Navy said. The call ultimately allowed the rescue of one wounded SEAL and the recoveries of the bodies of Murphy and two others killed in the firefight. President Bush will present the Medal of Honor to Murphy's parents at the White House on Oct. 22. "I think it is a public recognition of what we knew about Michael, of his intensity, his focus, his devout loyalty to home and family, his country and especially to his SEAL teammates and the SEAL community," Murphy's father, Daniel Murphy told Newsday for a story published on its Web site. The Medal of Honor is the nation's highest military award for valor in action against an enemy force. Murphy is the fourth Navy SEAL to receive the medal and the first since Vietnam. The other two SEALs killed in the Afghan firefight, Petty Officer 2nd Class Danny P. Dietz, 25, of Littleton, Colo., and Petty Officer 2nd Class Matthew G. Axelson, 29, of Cupertino, Calif., previously received the Navy Cross, the second-highest honor. A U.S. helicopter that went to rescue the SEALs was shot down by enemy fire; 16 SEALs and Army special operations troops were killed in the crash. The entire battle resulted in the worst single-day loss of life for Navy Special Warfare personnel since World War II. Two Medals of Honor have been awarded posthumously in the Iraq war. GARDEN CITY, N.Y. - A Navy SEAL who was killed while leading a reconnaissance mission in Afghanistan will receive the nation’s highest military award, the Medal of Honor. In late June 2005, Murphy led a four-man reconnaissance mission east of Asadabad trying to find a key Taliban leader in advance of a mission to capture or destroy the local militia leadership. Taliban sympathizers alerted fighters to the SEALs’ positions, and the four men were quickly outnumbered and came under fire, the Navy said. President Bush will present the Medal of Honor to Murphy’s parents at the White House on Oct. 22. “I think it is a public recognition of what we knew about Michael, of his intensity, his focus, his devout loyalty to home and family, his country and especially to his SEAL teammates and the SEAL community,” Murphy’s father, Daniel Murphy, told Newsday for a story published on its Web site. The Medal of Honor is the nation’s highest military award for valor in action against an enemy force. Murphy is the fourth Navy SEAL to receive the medal and the first since Vietnam.